I mentioned in my January Book review my method of checking out e-books in order to keep my reading list beefy. Here’s how you too can check out e-books for free without losing your mind, or your books. Every library in your state has one common website for checking out e-books. I live in Iowa, so I use Bridges. Just check with your local library by giving them a call, or do a quick search for your state’s website. Getting started is very easy as long as you already have a card with your local library. I’m a Kindle sorta gal because I love how user-friendly the FREE app is. Kindle saves your highlights, notes, and bookmarks even when you’re reading a loaned book, and if you ever check out the same book or if you buy it, your notes are saved FOR-EV-ER for you (in the menu under Notebook). I love that. I’m just so used to Kindle features. You don’t have to have a Kindle device to use the Kindle app. I read with the app on my phone. Your e-library site will also have plenty of other formats available, like audio books, videos, and other readers to choose from. When I’m browsing for books to read, I filter the results by Kindle to make sure I’m not disappointed in the formatting options. Check Out Your Book Already! When your book is available for you to check out, you will receive an email and perform a happy dance. Just follow the link in the email and select the option to check out the book. For Kindle, once you have checked out your book, you’ll log in to your Amazon account and go to the “Manage Your Content and Devices” option under your account menu. Just click on the button to check it out to your Kindle! 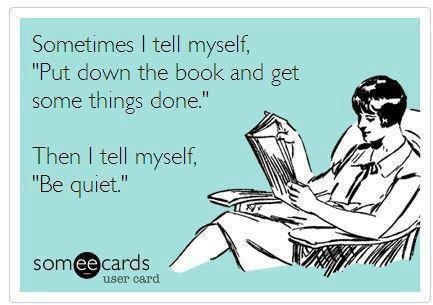 The first thing you should do after finding books you’d like to read is to place them on hold. There may be a long wait, so start browsing and reserving as many as possible. The more copies of a book there are, the faster you’ll get a popular book. It’s hard to tell when your turn will come up for a book on hold, but a conservative estimate is two weeks per person, per copy. Just be patient and flexible! I use my e-library’s wish list to save titles that are not in high demand and are available. Then if I’m playing a waiting game for more popular choices, I have something to read as a “filler”. The thing is, just because it’s available immediately doesn’t mean it won’t be good. Often it’s the classics and less popular choices that really make my reading list interesting! You can also use your wish list as an extension of your holds list, for books that you want to read but aren’t DYING to read. Once your holds list slims down, go to your wish list to add your next choices. Of course, the third option is using your wish list as an actual list of books you’d like to buy, so you have a handy reminder of your favorites. One important thing to note: you can’t renew a book. After two weeks, your book disappears from your Kindle and goes to the next person who has a hold on the book. Of course, if there are no other holds, simply check out the book again right away. This has meant that I’ve been in the middle of a gripping saga that would take most human beings with a life more than two weeks to read when it suddenly disappeared. I immediately put a hold on it again, and saw that I was “#1 on 1 copy” which meant that there was one other person reading it and I’d get it next, in a minimum of two weeks. I tried to read a filler book in the meantime, but seriously, it kind of sucked. Told you there was drama. I apologize for the name of this sub-header, BTW. Sometimes you’ll want to return your book if you finish it quickly or just didn’t like it, to free that title up for others, and especially because there is a limit on how many books you can check out at once. For our e-library, the limit is three. To return your Kindle book, find that “Manage Your Content and Devices” menu in your Amazon account again, then click the little ellipses (…) under the “Actions” menu and you’ll see a link to “Return this book”. Sorry for all the quotes. Once I started, I couldn’t stop. I like to note which books were my favorites, in case I decide to buy it later. I try to read a good amount of books, so I find it helpful to keep track of what I can’t live without and look out for sales. Okay, so that’s my little e-library guide. If you’re just beginning to read books this way, it can be a little confusing (even though it’s simple) because the rules are different than when you’re checking out hard copies. I hope you found this helpful. Happy reading!